The Robert Wood Johnson Foundation-supported Systems for Action research program is again soliciting proposals for new research studies that test novel strategies for aligning medical and social systems. The deadline of October 10 is fast approaching. So why do we need your new research ideas? The fact is that our toolbox of research-tested strategies for addressing social determinants of health remains alarmingly sparse. Research has produced a large body of knowledge about how social, economic, and environmental circumstances influence health and health equity. We understand the problem better than ever before. Additionally, research has given us valid ways of identifying the populations and individual patients who experience unmet social needs that, if left unchecked, will contribute to adverse health outcomes. We understand who is at risk better than ever before, and we understand that all of us are adversely affected by social conditions that morph into health inequities. Most recently, research has begun to identify actions and interventions that appear effective in connecting patients to services and supports that can help address unmet social needs, such as the Health Leads program and its extensions, and the CMS Accountable Health Communities model. Increasingly, we understand that solutions are possible. Unfortunately, individual interventions implemented in isolation have yet to achieve the scale and spread necessary to improve health and health equity for large segments of the U.S. population. Our existing systems are not configured to support these interventions. 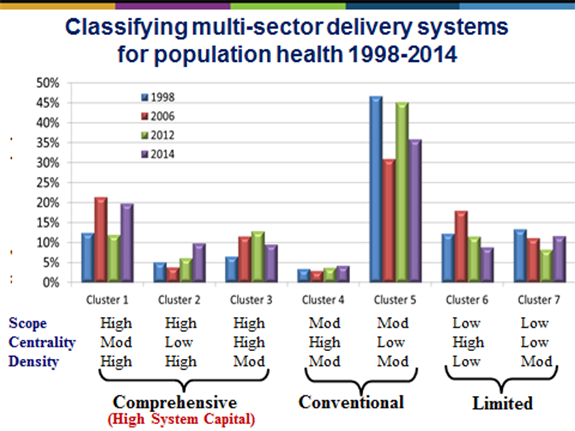 Delivery and financing systems for medical, social, and public health services operate largely in isolation from each other, despite pursuing many common goals and serving overlapping populations. These systems interact in complex and often poorly understood ways through fragmented funding vehicles; information systems; governance and decision-making structures; implementation rules and strategies; and professional practices. Fragmented and poorly coordinated health and social systems can easily blunt, overwhelm and undo even the very best social determinant interventions. New research is needed that can help untangle the complex interactions of health and social systems and expose novel ways of coordinating systems to improve health and health equity. Very few research-tested models currently exist that describe how to align and coordinate the delivery and financing systems for medical, social, and public health services. We urgently need new studies that can help to fill up our toolbox of models that work. I invite you to download our Call for Proposals brochure, review the studies we’ve funded to date, and submit your research proposal by October 10. It doesn’t require deep thinking to appreciate the importance of public health laboratories to national health security. Labs detect disease outbreaks as early and quickly as possible. Labs accurately identify pathogens in air, water, soil, food, humans and other animals. Labs rapidly convey test results to public health responders who can close restaurants and schools, quarantine infectious people, evacuate neighborhoods, issue public warnings and otherwise interrupt the cascade of exposure and transmission. In sum, labs are the central nervous system of the health security enterprise. So, can you identify the most heavily questioned and hotly contested element of the National Health Security Preparedness Index? Believe it or not, it is the set of measures that indicate what public health laboratories do. The controversy stems from the concept of assurance. And it flows from the many different ways that public health responsibilities get divvied up across state governments. 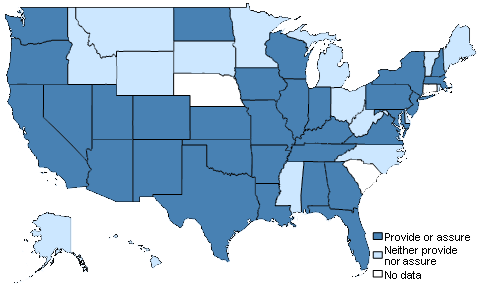 In most states, multiple laboratories exist, operated by different state agencies. 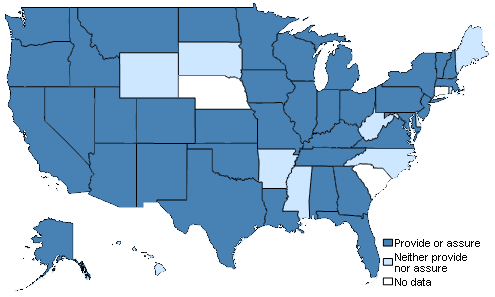 Public health laboratories are often organized within state health agencies, but sometimes they are organized as independent state institutions or as part of state university systems. Environmental laboratories are often located within state environmental protection agencies, which may or may not fall under the umbrella of a health-related super agency. Agricultural laboratories are found within state agriculture agencies. And of course there are clinical labs located within state hospitals, crime labs located within state law enforcement agencies, and medical examiner’s labs located somewhere in this mix. Which lab is responsible for testing food samples for pathogens? Which lab tests air, soil or other environmental samples for harmful substances like lead? Which lab tests public drinking water sources, private wells, or recreational bodies of water? Which lab tests the white powder found in an office building? Political dynamics add to the controversies surrounding heterogeneity in laboratory structure. Environmental and agricultural labs conduct testing largely in support of the regulatory enforcement duties carried out by their parent agencies. Some of the tests performed by public health labs also fulfill regulatory purposes, but these labs typically have a broader surveillance mission and a wider scope of responsibilities. Concerns about industry capture and political interference in testing exist, and examples that fuel these concerns are not hard to find. Long ago, laboratory experts at CDC and at state public health laboratories recognized the problems that can arise when testing capabilities exist in one agency but interpretation and response capabilities reside in other corners of state government. Information does not always flow seamlessly through government bureaucracies. The legal authority to act and the scientific knowledge about what to do are distributed unevenly across agencies. This situation can cause delays in responding effectively to hazards detected through laboratory testing. And delays can have serious human and economic consequences. 1. Recognize that public health testing and reporting capabilities are carried out by a multi-agency system of laboratories in most states. 2. Recommend that a state’s designated public health laboratory take responsibility for ensuring that all necessary health-related testing and reporting capabilities exist somewhere within the state’s laboratory system and are implemented effectively. The laboratory can carry out this assurance function either by directly providing necessary testing and reporting activities itself OR by confirming that another laboratory somewhere within the state system provides these activities effectively. This “provide or assure” recommendation for state public health laboratories forms the basis of CDC’s and APHL’s Comprehensive Public Health Laboratory System definition and its Core Functions and Capabilities of State Public Health Laboratories framework. Moreover, this recommendation is formalized in the federal Healthy People 2020 health objectives for the nation. How Does the Index Measure Laboratory Capabilities? The National Health Security Preparedness Index follows the recommendations of CDC and APHL when measuring public health laboratory capabilities. In fact, we use a series of measures constructed from periodic surveys that APHL fields with state public health laboratory administrators. The measures in this series indicate whether or not the state public health laboratory “provides or assures” testing of water, air, soil, and human samples for specific pathogens and hazards. A state receives credit for having a specified capability if the public health laboratory directly performs the test, OR if it assures that another laboratory entity performs the test. The controversy arises in states where a certain type of test is performed by an environmental or agricultural laboratory, but there is no assurance function performed by the public health laboratory. In these cases, the capability to test for a certain hazard exists. But the capability to assure that the testing and reporting function is carried out effectively does not exist within the public health laboratory. 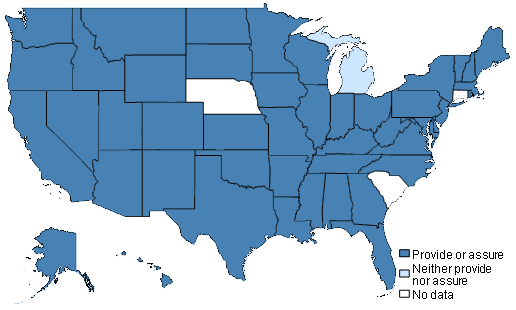 Such states do not comply with the CDC/APHL recommendation. By following the CDC/APHL recommendations, the Index measures the assurance capability rather than the testing capability alone. And as you can imagine, some states don’t agree with this way of measuring laboratory capabilities. Testing vs. Assurance: Are We Measuring the Right Stuff? The CDC/APHL “provide or assure” recommendation for public health laboratory testing reflects the consensus opinion of experts and experienced laboratory professionals at the dawn of the 21st century. As a recommendation based more on experience than on rigorous scientific evidence, it should remain open to continued evaluation, critical analysis, and revisions over time. The Index continues to monitor the scientific and professional literature on this topic, and we stand ready to update our measurement approaches as professional norms and standards evolve. One issue in need of clarification involves how the assurance function should be defined and carried out by public health laboratories across the U.S. The APHL surveys used in constructing the Index rely on information that is self-reported by individual laboratory administrators. 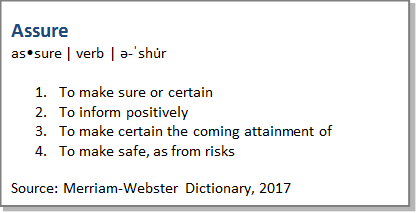 The surveys provide little guidance about what is meant by “assurance” and how laboratories should carry out this function in cases where they do not directly perform the testing. Consequently, it is left up to the interpretation of individual administrators as to whether or not their laboratory carries out the assurance function. Is assurance really all that important? Isn’t it enough to know that testing exists somewhere within the state bureaucracy? Clearly some people think so. But in the absence of clear scientific evidence, the Index relies upon well-reasoned professional recommendations like those from CDC and APHL. It is not very difficult to find real-world examples that support the underlying logic of the “provide or assure” recommendation. As one example, Arizona’s environmental laboratory has responsibility for testing the safety of public drinking water systems, but it does not have the legal authority to notify the public of potential hazards. As a consequence, residents of one community waited years to learn that their drinking water supply had seriously elevated levels of uranium contamination from a defunct mine. The Flint water crisis provides another recent example of the problems posed by organizational complexity in lab testing and response. In that case, Michigan’s environmental agency held responsibility for overseeing testing of Flint’s drinking water system, but the state’s public health agency had responsibility for monitoring test results for reportable diseases like Legionnaires’. Delays in connecting the dots between water test results and disease surveillance enabled the hazards in Flint to persist and grow unchecked. We hope the Index will stimulate further dialogue, discussion, and debate about these important issues in health security. Publicly accessible data, rigorous analysis, and critical thinking lead the way to a clearer understanding of actions that can strengthen health protections for everyone. Investments in public health programs appear to reduce spending in the Medicare program, providing an economic benefit for seniors and the federal budget as growing numbers of baby boomers join Medicare. Results from a new study published in the December issue of the journal Health Services Research by our research team at the University of Kentucky suggest new directions for containing costs by aligning medical and public health programs. Public health programs aim to prevent diseases and injuries within the public at large, such as those caused by tobacco smoke, poor nutrition, inadequate physical activity, contaminated food and water, or exposure to infectious diseases like influenza. Logic dictates that these programs, if effective, may reduce the need for costly medical care, particularly as people age and accumulate health problems. But research confirming the existence and the size of this effect, which economists and policy analysts call a medical cost offset, has not been available until now. The new study tracks hundreds of U.S. communities over the period 1993-2013. We measured the amount of money spent annually by local public health agencies in each community, and linked these data with measures of Medicare spending per beneficiary in the same local areas, along with detailed information on demographic, economic and community characteristics. 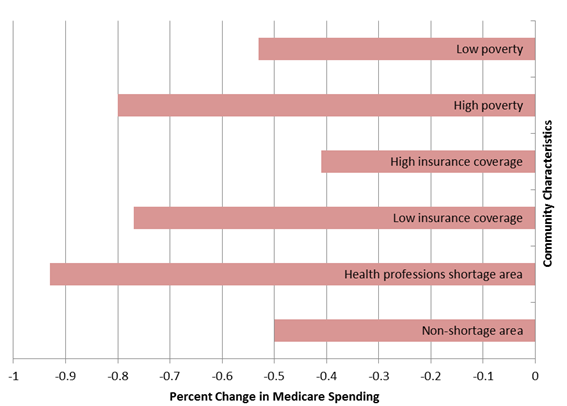 Using an advanced statistical methodology known as instrumental variables analysis, we estimated how public health spending influenced Medicare spending over time, while controlling for other factors that tend to obscure the true causal relationship between these two types of spending. The results show that Medicare spending per beneficiary fell by about 1 percent for each 10 percent increase in public health spending per resident, with larger offsets observed in low-income and medically underserved communities. These findings suggest that the federal Medicare program could realize an average of $1.10 in savings for each $1.00 invested in local public health activities over time. A large body of research examines the causes and consequences geographic variation in Medicare resource use – work led by scholars at Dartmouth and elsewhere. Most of the empirical research has focused on supply-side factors and, to a lesser extent, patient preferences. This study is the first to suggest that public health programs and resources may contribute to this variation in important ways. Local public health agencies appear to generate important but largely hidden economic benefits for their communities, alongside the more visible health benefits. Consequently, medical providers who participate in Medicare’s value-based payment models like accountable care organizations and shared-savings programs should explore the roles that public health agencies can play in helping to improve outcomes and contain costs. One challenge highlighted by the study’s findings is the so-called “wrong pocket” problem that can undermine incentives to invest in public health programs. Many public health agencies are funded predominantly by state and local government contributions, but the Medicare savings generated by their work accrues to the federal government. Resolving this problem will require new models for public health financing, such as including public health agencies in Medicare’s shared savings models. The study cannot rule out the possibility that other factors may contribute to the observed connection between public health spending and Medicare savings in local communities. For example, communities that choose to invest in robust public health programs may support other social and community resources that help to constrain Medicare spending, such as better housing and transportation options for seniors. Nevertheless, the study’s strong research design and analysis make this possibility less likely to affect the results. It’s Hurricane Preparedness Week, How Strong is Health Security Where You Live? The U.S. has experienced relatively mild hurricane seasons in recent years, and this trend may continue in 2017 according to some models. Hurricane season reminds us of just one of the many types of events that can threaten the health status of large groups of people in the U.S. each year. These events – including storms, fires, floods, infectious disease outbreaks, and infrastructure failures – are uncertain as to their exact location, timing, geographic scale, and intensity. For this reason, health security experts recommend that all states and communities maintain a broad spectrum of health protections that help to keep people safe and healthy regardless of the type of hazard that may occur. Unfortunately, the latest results from a national index of health security indicates that these protections are far from equal in strength across the U.S. The National Health Security Preparedness Index uses big data and analytics to summarize the strength of health security protections across the U.S. and to track changes over time. 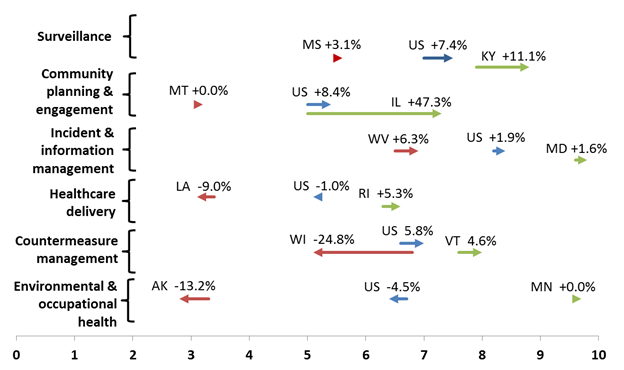 The latest results show trends for the period 2013 through 2016 for every U.S. state and the nation as a whole. The comforting news is that health security has trended upward steadily for the nation as a whole. The troubling news is that some people enjoy much stronger protections than others based solely on where they live. For example, the Index shows that residents of the Deep South experience health security levels that fall significantly below the national average, despite their history of exposure to hurricanes and other damaging storms. 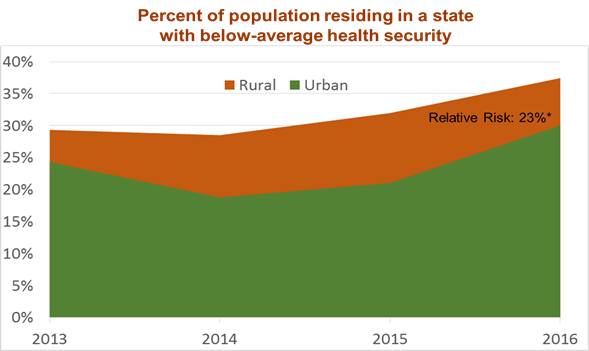 Across the U.S., states with higher poverty levels, larger rural populations, and lower rates of health insurance coverage tend to fall below the national average on measures of health security. The Index was created by the U.S. Centers for Disease Control and Prevention, and is now supported by the Robert Wood Johnson Foundation. Last week we shared insights from the latest Index results at the Preparedness Summit 2017 in Atlanta, one of the largest convenings of health security stakeholders in the U.S. Whether or not you live in a region vulnerable to hurricanes, you have many reasons to care about health and social systems and their ability to protect people when hazardous events occur. For this reason, you will want to visit the Index website and explore its data and measures. And you can join the health security Innovator Challenge by devising a novel way to use the Index in stimulating actions that strengthen health security. How can we better align delivery and financing systems for medical, social, and public health services in ways that improve health and health equity? Research shows us with increasing clarity that social, economic, and environmental conditions strongly influence health and health equity for individuals, families, and communities. But we also know that services and supports designed to improve these conditions—such as housing, transportation, education, income and employment assistance, child and family supports, and legal and criminal justice services —are often disconnected from the medical services and public health programs tasked with improving health. As a result, people experiencing adverse social, economic and environmental conditions are more likely to develop costly and preventable health conditions, but they are less likely to benefit from the medical and public health services available to them. We need more scientific evidence about productive and feasible ways to defragment our medical, social, and public health systems in order to solve these coordination problems. For colleagues who have a special interest in the organization and economics of public health services, the S4A program is a golden opportunity for studying the ways in which public health strategies can help to connect the dots between the medical and social service needs faced by individuals and communities. 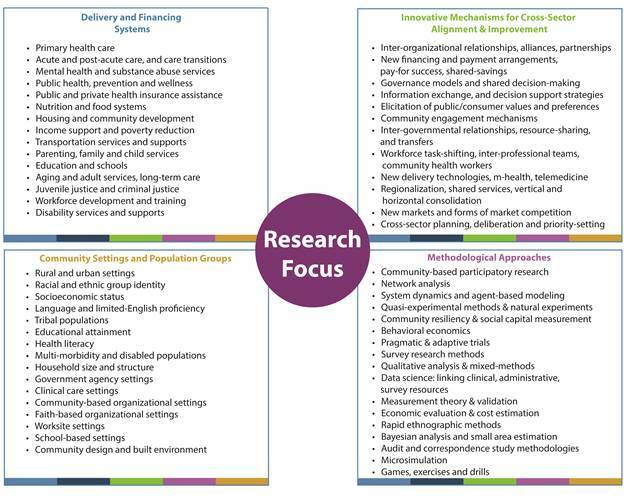 All of the research supported through S4A pursues an overarching focus on how system alignment strategies can help to achieve health equity by activating key drivers represented in the RWJF Culture of Health Action Framework. This year we seek research proposals in two different categories: (1) a category for exploratory and developmental studies and (2) a category for full research studies that examine impact and effectiveness. Submit your research idea today! Post-election policy debates concerning the future of the Affordable Care Act focus heavily on the 20 million people who gained health insurance coverage under the law. But the future of less-visible components of the law – especially its population health provisions – may be equally important to the nation’s long-run health and economic wellbeing. Which provisions should be scaled up or down as U.S. policymakers revisit health reform over the next four years? The ACA stimulated a surge of new interest in the science and practice of improving population health. The aim of this work is to improve health status for large groups of people and entire communities, rather than doing so one patient at a time through an expensive and fragmented medical care system. This work includes upstream strategies for keeping people healthy in order to reduce the flow of patients into the medical system with preventable health conditions. The ACA established population health improvement as a central component of the Triple Aim strategy on which many of the law’s payment and delivery system reforms are based. Since then, hospitals, health systems, insurers, pharmaceutical manufacturers, information technology companies and large employers have created new organizational units devoted to population health. And public health professionals and preventive medicine specialists also claim large swaths of territory in the population health frontier. Despite this enthusiasm, population health strategies remain controversial due to their heterogeneity and lingering uncertainties about their effectiveness. Over the past 6 years, a wide array of population health initiatives have been developed and tested, including those supported by the ACA’s Prevention and Public Health Fund and the Center for Medicare and Medicaid Innovation. What is lacking in the emerging field of population health is a coherent description of the essential ingredients, backed up by sound research. 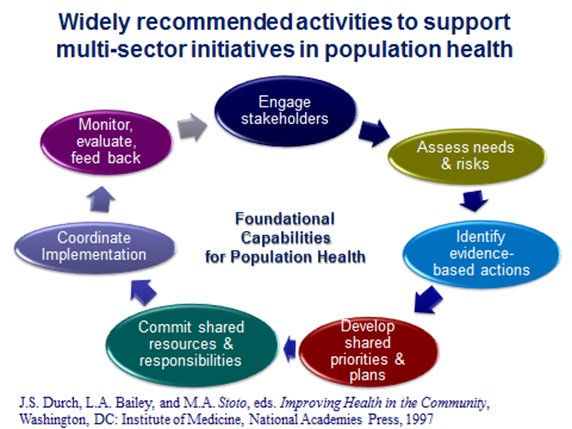 What capabilities does every community need in order to succeed in improving health status for the population at large? A 2012 National Academy of Medicine study called for additional research to define this set of foundational capabilities and to quantify the resources required to establish these capabilities in every community. This month the journal Health Affairs published results from one of our new studies that sheds light on this question by combining information from a long-running national survey of communities, “hard” data on health outcomes, and strong econometric methods. Specifically, our study examines whether certain combinations of population health activities lead to improved health outcomes when implemented over time by community organizations. We followed a national cohort of more than 300 communities over a 16 year time period to examine the extent to which community organizations work together in implementing a set of activities designed to improve health status in the community at large. The population health activities measured in this study are based on practices long recommended by the National Academy of Medicine and other scientific and professional advisory groups. These activities include conducting regular assessments of health status and needs in the local area, developing shared priorities and plans for health improvement, educating community residents and leaders about health priorities, investing resources in shared health priorities, and evaluating the results of these investments. These activities are reflected in many current national guidelines and model practices for health improvement, including CDC’s Community Health Improvement Navigator program, the Robert Wood Johnson Foundation’s Foundational Public Health Services framework, and the U.S. Department of Health and Human Services’ Public Health 3.0 framework. We used cluster analysis methods to classify communities into comparison groups based on the spectrum of population health activities implemented in each community and the constellation of organizations engaged in implementing these activities. 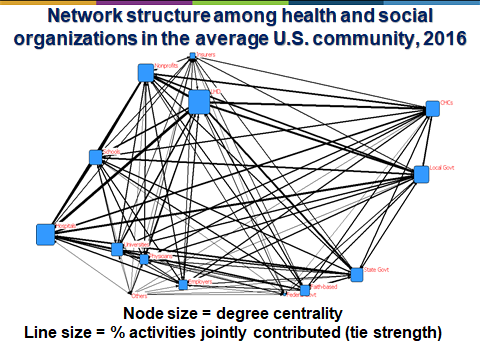 Communities that implement a broad spectrum of population health activities through dense networks of collaborating organizations are classified as comprehensive delivery systems for population health activities, while the remaining communities were classified either as conventional or limited delivery systems based on their spectrum of activities and collaborative networks. We linked survey data on population health activities in more than 300 communities with county-level health outcome measures indicating deaths from potentially preventable conditions during the period 1998 to 2014. We also linked these data with a rich set of measures reflecting community demographic, socioeconomic, and health resource characteristics. Collectively, these data allow us to track how the spectrum of population health activities in each community changes over time, and how these changes relate to health outcomes. 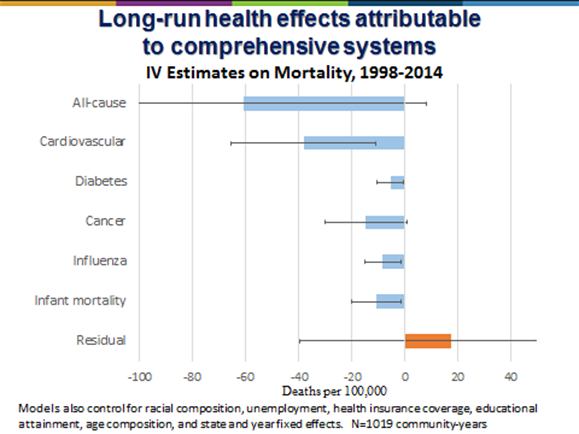 Using the method of instrumental variables analysis, we generate causal estimates of how changes in population health activities impact community mortality rates after adjusting for other determinants of health in the communities. By carefully analyzing data spanning 16 years, the results showed that deaths from preventable causes such as cardiovascular disease, diabetes, influenza and infant mortality declined significantly among communities that implemented a broad spectrum of population health activities through dense networks of collaborating organizations. Preventable deaths were more than 20 percent lower in the communities with the strongest networks supporting population health activities, compared to communities with less comprehensive networks. These differences in mortality persisted after controlling for a wide range of demographic, socioeconomic, and health resource characteristics in the communities, including using causal estimation methods that control for unmeasured community differences. These results give us the clearest picture yet of the health benefits that may accrue to communities when they build broad, multi-sector networks to improve population health. Achieving better outcomes in this study was not simply a matter of implementing widely-recommended activities involving assessment, planning, priority-setting, resource deployment, and evaluation. Communities needed to implement a broad spectrum of activities and engage a full range of partners in these activities in order to reduce mortality. The results suggest that strong collaborative networks help communities arrive at the best decisions about how to invest limited resources in high-impact health solutions. The population health activities examined in the study include those now incentivized through the federal Affordable Care Act and related health reform initiatives. Tax-exempt hospitals are required to conduct community health needs assessments in their local service areas, develop community health improvement plans, and report annually on their expenditures related to community benefit activities. And state and local public health agencies are required to undertake similar activities in order to meet voluntary national accreditation standards. 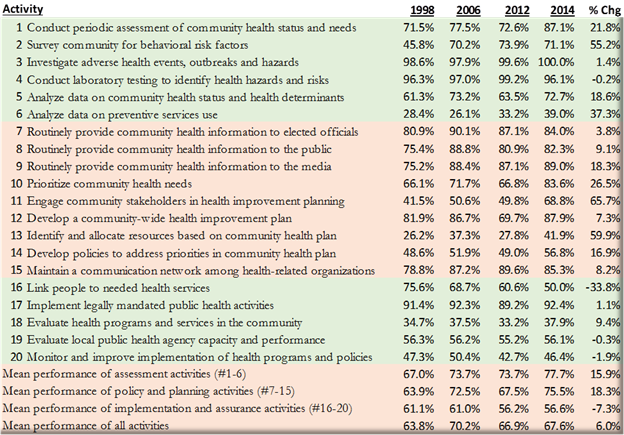 The communities that achieved significant reductions in mortality in this study, however, progressed beyond health assessment and planning activities to include shared investment of resources along with monitoring and evaluation activities. Perhaps most importantly, the communities that achieved sizable reductions in mortality appeared to do so by engaging broad networks of organizations in implementing population health activities rather than relying on independent and uncoordinated efforts. The network effects appear to be major drivers of these results, which are consistent with a growing body of research indicating that community networks can function as force multipliers. We recommend that these key ingredients receive careful consideration in the post-election “keep or kill” policy debates about the future of ACA’s population health components. What Can We Say about Cost and Value? A complete understanding of the value of population health activities to society requires estimates of both benefits and costs. Estimating the resources required to implement population health activities is beyond the scope of our Health Affairs study, which focused only on estimates of health impact. Nevertheless, post-election “keep or kill” debates about ACA and population health are likely to focus heavily on costs as well as benefits. We recently conducted a related study to generate first-generation estimates of the costs required to implement Foundational Public Health Services as recommended by the National Academy of Medicine and as defined by a Robert Wood Johnson Foundation supported expert panel process. The services defined and measured in this new costing study do not perfectly match the population health activities measured in our Health Affairs study, but the two sets of measures are closely aligned conceptually. As a result, it is instructive to compare the health impact estimates from our Health Affairs study with the cost estimates from the costing study. Results from the costing study indicate that full implementation of foundational population health activities in every U.S. community would require $26.3 billion per year in 2016 dollars, a total that is about 70% larger than the estimated $15.4 billion currently spent on these activities in 2015-16. Combining these cost estimates with the mortality reduction estimates produced in the Health Affairs study (and making some conservative assumptions about how mortality reductions translate to life expectancy gains), we estimate that the cost per life-year gained through investments in population health activities is on the order of $7,200 – a number that implies foundational population health activities are potentially a very wise investment. Of course these estimates of value are very crude back-of-the-envelope calculations, requiring further analysis and refinement. Our research team along with many others are continuing to study these issues with the hope of informing ongoing decisions in health policy and health systems. Our research is part of the new Systems for Action research program created by the Robert Wood Johnson Foundation as part of its national action framework for building a Culture of Health. Based at the University of Kentucky, Systems for Action supports research that evaluates mechanisms for aligning medical care, public health, and social services in ways that improve health and wellbeing. I invite you to stay up to date on the research progress by following this blog, the Systems for Action website, my research archive, and my twitter feed. Equal Protection? What Zika and Big Data Reveal About Emergency Preparedness Across the U.S. Equal protection is a principle worth striving for in emergency preparedness as in other spheres of human endeavor. My new blog post for the National Health Security Preparedness Index uses the big data included in that Index to explore inequities in health protection. Not every American community will experience Zika transmission. But every community needs the ability to prevent, detect, and manage emergencies in ways that minimize morbidity and mortality. Read more here. 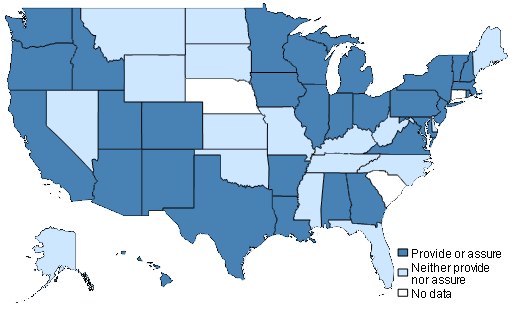 Preparedness levels since 2013 have varied widely across domains and states. Glen Mays is the F. Douglas Scutchfield Professor of Health Services and Systems Research at the University of Kentucky. He studies strategies for organizing and financing public health services, preventive care, and prevention policy, with a focus on estimating the health and economic effects of these efforts. He directs the Public Health Practice-Based Research Networks Program funded by the Robert Wood Johnson Foundation, which brings together more than 1000 public health agencies and researchers from around the nation to study innovations in practice. Mays also directs the RWJF-supported National Coordinating Center for Public Health Services and Systems Research and the National Longitudinal Survey of Public Health Systems, which since 1998 has followed a nationally representative cohort of U.S. communities to examine the implementation and impact of multi-organizational public health strategies. He earned a A.B. degree in political science from Brown University, M.P.H. and Ph.D. degrees in health services research from UNC-Chapel Hill, and completed a postdoctoral fellowship in health economics at Harvard Medical School. Where did i run today?